I’m assuming though he’s looking at his fire for yakitori and the customer is a regular who has arrived a little too early? The contrasting yellows and darker colors on either walls are really cool! Thanks. Happy with this one. The expressions, colours etc. Came out better than I expected. But no, don’t think so. 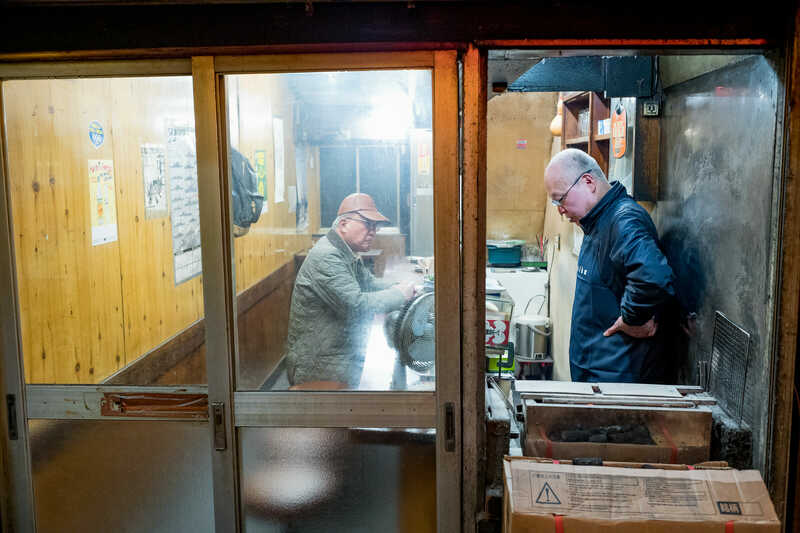 It was well past opening time, and his yakitori grill is to his left. Or at least I’m sure that’s the grill he uses. Sad but a great atmosphere. The single customer makes the shot for me! Cheers. Yeah, that one customer and both their looks does create a quiet, distinctly sad atmosphere. Not happy about the situation of course, but happy to have captured it. Haha, very good. Very good indeed!